I think you can´t have enough file recovery utilities once you lost data on your computer either by accidentaly deleting the files or by crashes or hardware failures. It is better to have one additional try at recovering the data than to give up if the first program that you´ve been using failed to recover the files. It is even better to already have those programs installed or ready at hand to use them immediately after you have lost the files. Chances that you are able to recover the files are highest right after the incident because no new data was written in the sectors the deleted files occupied. I signed up with Relakks yesterday and was satisfied with this clean and easy process. I had to provide only some information like name, email, password and username and was able to log on to their system. My status was inactive at that time because I did not make a purchase yet. I decided to try the service for one month and had to provide my credit card details in order to do so. One month would cost 6$ which is a good price if they live up to their promises which are a) anonymous internet experience and b) maximum speed. Sometimes I´am writing about things that are great but are not that closely related to the overall theme here at ghacks.net. The approximately hundred drawing lessons at drawspace.com are one of those exemptions. After a free registration you may view a drawing lessons in the beginners, intermediate or advanced class. I´ve written some articles on Pandora before; For those who have not heard of the service let me shortly explain what it is all about. Pandora is a music service thats looks at your choice of music and tries to find music that matches this taste. You are free to add a song title, a album or artist and Pandora creates a radio station that plays music that is like the music that you have chosen. The music plays then in your browsers window until you close it. Onlinetvrecorder.com is a completly legal service that allows you to record European tv shows online and download them later to view them on your computer. The main focus is on German tv but you also find Belgian, Swiss and some English stations like CNN. All you have to do is register at the website which offers a German and an English interface for its users. After creating the account you are free to create new recordings using the EPG schedule, a EPG search or a manual mode. Startup Control Panel and Startup Monitor are actually two programs not just one. The first, Startup Control Panel, is a 59K freeware that scans various paths and registry entries for programs that are run at startup. This is great if you need a quick basic overview, if you need an in depth overview try autoruns from sysinternals. Startup Control Panel lists three registry entries and two paths, those are the locations where most programs are autostarted. Old adventures never die. They only get remade. Back in the days before DOOM became the pop phenomenon it still is, the adventure game genre reined supreme. Adventures were cutting edge, they were. 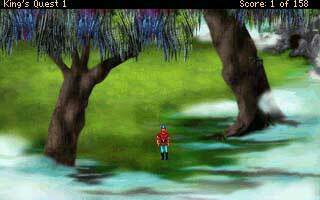 Names like Kinq’s Quest, Larry Laffer, Zak McKraken or Maniac Mansion were common household items and easily quite a bit more popular than your average garden gnome. I love little useful freeware programs, the smaller the better in my opinion. Mikes Command Line is another one of them with 72K in size. The freeware opens a single line command bar when executed. You may then type the name of a program, e.g. notepad or calc and the program window of the program that you typed in opens. This by itself is mighty useful but wait until you hear this. The Adbobe PDF document that is currently loading is slowing down the whole computer ? Quicktime takes ages to initialise ? Media Player is unbelievable slow and tries to phone home ? Why don´t you try freeware alternatives to those heavyweight programs ? I´am already using alternatives and my system became faster and more stable while keeping the same functionality. The message "Disk Mode Ok to Disconnect" appeared suddenly on my Ipod Nano without me knowingly turning this mode on. I tried to use the buttons or the wheel to turn it off but nothing seemed to work. I was getting desperate and decided to google for a solution. Many people are using the Ipod and it was highly unlikely that I was the only one experiencing this strange disk mode. You have got lots of different file formats on your computer: jpg, jpeg, gif, bmp and png or rtf,txt,doc and pdf for instance. The big question that comes to my mind is why do we need that many formats. Most file formats offer no gain over the other, would not it make sense to convert all files of a certain type to one format only ? It is very handy to have a linux live CD at hand when your system crashes and your operating system of choice does not boot anymore. This could mean that either the software or the hardware fails to load the operating system. You should try to diagnose the problem with a live CD before thinking of reinstalling the operating system or exchanging parts of the hardware. TweakUi should be one of the first programs to install after the Microsoft Windows XP Setup. It offers a wide range of features, aka tweaks, that override Windows XPs default settings. After installing the freeware you can access it in your start menu in the folder powertoys for windows xp. TweakUi consists of tabs on the left side that expand in the right main window once you click on them. Tabs include Explorer, Mouse, Logon and Templates for instance. Password chart is an online service that helps you improve the quality of your passwords. The principle is pretty easy: You enter a phrase at the beginning which will be used to create the password chart. An example would be "Make your passwords stronger with passwordchart.com" or "https://www.ghacks.net/ is gr3at". The password chart will be displayed on the right side of the screen changing while you are adding new chars to the phrase. You can opt to add numbers and punctuation for increased security, they will be added to the chart on the right. I´am always leaving my computer for the time that it is defragmenting the hard drives, it takes way to long to sit there and wait for the process to finish. The defragmentation seems to take forever to finish on my three hard drives and I was looking for a way to speed things up a bit and reduce the time that I could not work with my computer. Panicwipe is a one click solution to delete unwanted files securely from your system. 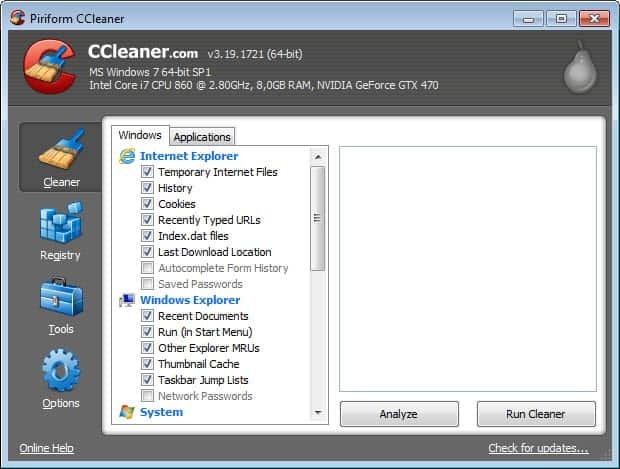 The freeware is able to delete programs, files, folders, registry entrys, IE cache, history and cookies with one simple click. You´ve got full control over the whole process of course: you select the data that you want to delete, everything else remains. Do you know about the differences between Blue-Ray and HD-DVD ? I mean, the real differences, not the technical mumbo jumbo that has no meaning in real life. With the releases of Training Day, Kiss Kiss Bang Bang and Rumor has it on Blue-Ray and HD-DVd the guys at High Def Digest were able to compare the two formats directly. All three reviews analyze the video and audio quality, the depth of supplemental content, the overall ease of use and menu navigation.